Twenty-three-year-old Susmita Rai's interest in kayaking safety work was sparked by her own husband's work in the tourist industry. But when she sought to transform a hobby into a career she came up against an impossible choice. Sanu Baba Sunuwar, concerned about their household and the perceived risks a Nepali woman might face in male-dominated tourist guide industry, issued her with an ultimatum: "It's either me or kayaking." Determined to make her own way, Susmita left her four-year-old son Niraj in the care of her in-laws and divorced her husband. Her decision marked the beginning of a difficult period during which she had to support herself through restaurant work, dishwashing jobs and hard labour. The tide began to turn when she encountered Inka Trollsas, a Swedish kayaker. Inka, who has been coming to Nepal for the last decade, runs Himalayan River Girls. This kayak club based in Pokhara trains Nepali women as river and rafting guides. With Inka, Susmita had real cause to believe kayaking and rafting could give her a future different from that she was destined for once she was taken out of school and married off at the age of thirteen. She began to train with Inka and in 2008, along with compatriots Sita Thapa and Anu Shrestha, competed against atheletes from 11 nations in the Peak UK Himalayan Challenge kayaking championship in Nepal. Susmita came first. Her triumph prompted a change of heart on the part of Sanu Baba Sunuwar, and led to their reunion. 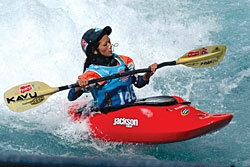 Since then, Susmita has represented Nepal at two kayaking championships in Spain and Switzerland. She continues to train, but has also set her sights on reaching the heights of her husband, quite literally: he is a paragliding pilot. Susmita has blazed her own trail. But she laments the lack of support for women in sport, either from government or from sporting associations. She is clear about the need for women to be given opportunities. "If I had given up kayaking for my family," she says, "then how would I have had the chance to fly the flag of Nepal in front of the world?" She smiles and adds, "Who would know who Susmita Rai is?" Susmita's husband agrees, and even goes as far to see their separation as a blessing in disguise. "If she had listened to me and given up kayaking, if we hadn't had a divorce, then how would my wife have become a champion?" Sanu Baba now feels other women should take Susmita as an example and follow their dreams. Inka's Himalayan River Girls has trained 10 women kayakers so far, and will be inducting new trainees in November. With a supply of equipment from abroad, Inka has been able to conduct training sessions on the Seti, Kali Gandaki and Trishuli Rivers. From November 27-29, her club will be helping to organise the Himalayan Whitewater Challenge for women. Himalayan River Girls is doing more than just honing the competitive spirit of Nepali women, however. Grounding its paddle work is the firm belief that training women like Susmita not only boosts their confidence but also makes them employable. So far, fifteen women have been employed by Nepali rafting companies through Himalayan River Girls which is run wholly on donation. Susmita herself works for Paddle Nepal. She's had a rough ride. But calmer waters lie ahead.